Like most llama and animal owners we really love our animals! It is hard to lose any member of our family, but unfortunately they just don't live long enough! This is the downside of owning a farm! When we first started breeding classics, we acquired Sunshine to be a cornerstone of our program and to use with our male Anders Tobias. Sunshine produced some very nice offspring for our herd and we kept all but one of them for our own breeding program. 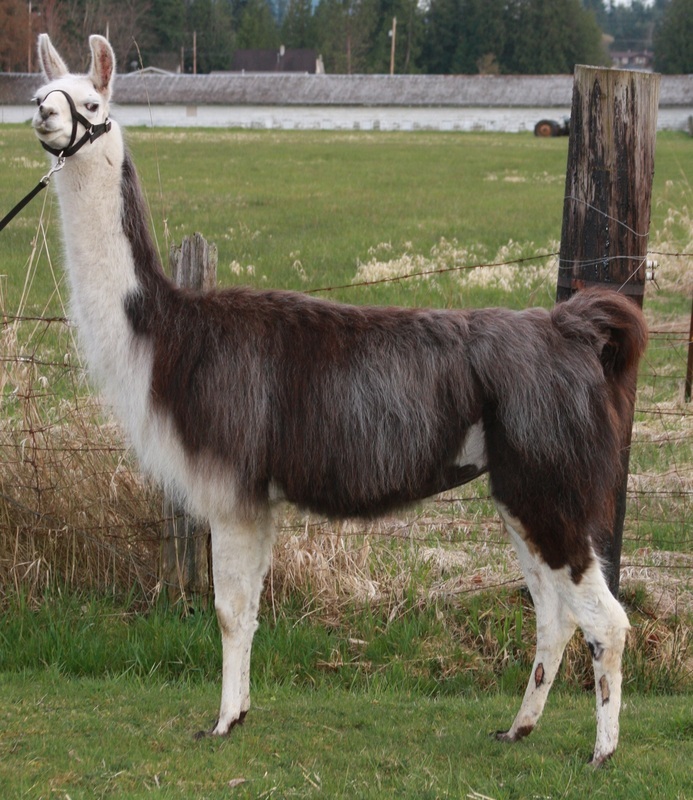 As avid drivers of llamas, Sunshine entering our program was a no brainer as her sire was an accomplished driver and packer for Bobra Goldsmith. Until the day she was put down, Sunshine remained upright, correct and beautiful. We had planned to show her again when she got Cancer. Walking an 18 year old into the ring is something few classic owners can do. We miss Sunshine and her production of smart and willing classic offspring. When our long time friend Lenore Kobayashi learned she had terminal Cancer in October 2014, she asked us to take her last two llamas. We agreed to give them a forever home and granted her last wish. It became apparent immediately that one of them was in pain and not healthy any longer, so we had her humanely euthanized shortly after her arrival. Misha was Lenore's favorite llama. She trained him to drive and did all kinds of neat things with him. He was clicker trained too to ring bells, take hats off etc. Misha was a nice llama to have around and got along with everyone. Lenore was an amazing friend and we were happy to do this for her (and her spouse Tatsuki). Misha was humanely euthanized due to being severely crippled from poor breeding. Hailee Poodle our first born Poodle child! Hailee was brought home while Jeff was on a business trip. Since she was a puppy her coat was still black and hadn't changed color yet. Niki broke it to him when Hailee was six months old that she would turn silver when she grew up. Hailee was born on August 29, 1999 and quickly become Jeff's personal fan club. Jeff is now a die hard "Poo" man because of Hailee. They played frisbee, swam and just about anything you can think of! Hailee was the perfect Poo who was on guard to intruders, but loved company if her parents weren't home. She could be counted on to deliver mail (Poodle deliveries) throughout the house to Niki or Jeff. When not guarding, playing or waiting for fun, Hailee was always sleeping on Jeff's pillow. Hailee was not only scary smart, she was a person in Poodle clothes! To say we miss her is an understatement. A piece of our hearts died with her. 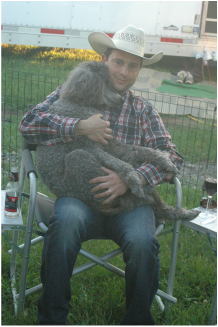 Many people we know got Standard Poodles because of Hailee! Nearly 26 years was not long enough with our sweet Aster. The smartest llama on the farm and dam/grandam to most of our program and champions. Aster was a Doolittle and Bask granddaughter. She is sorely missed around here! A darling and sweet girl who died way before her time. Cause of death was internal bleeding or a potential blockage. Rosie was a character and good girl. She died of age related complications. Medallia is a Full Sister to Our Many Times Champion Marisco! Medallia had an unfortunate accident and got caught in our New Zealand wire fencing. It is for that reason we no longer recommend this type of fencing. 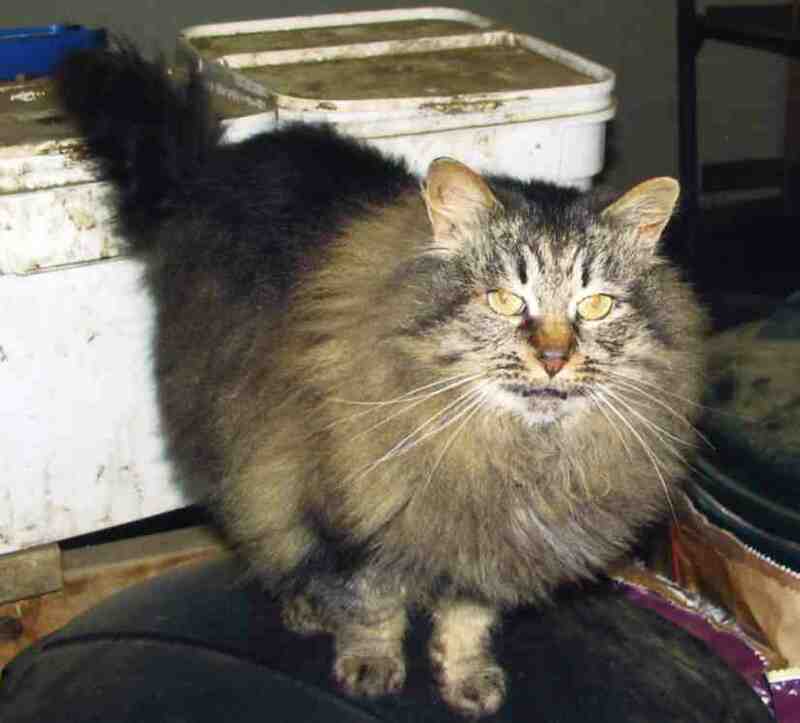 Nina was humanely euthanized because of age related issues. She was a legendary female with the most beautiful face in the industry! 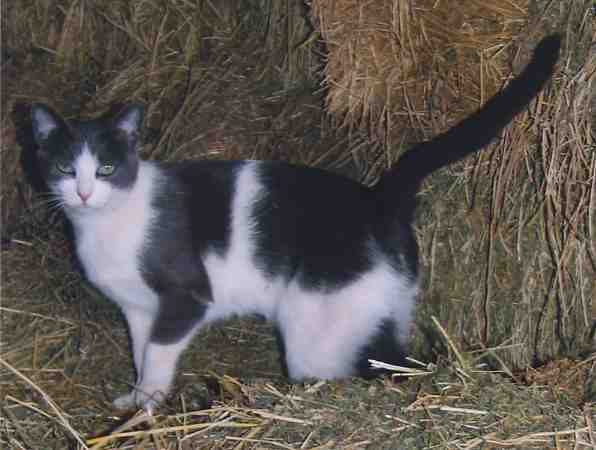 Shadow was Niki's barn cat. She would stand up on her back feet to be pet and purred when she was sheared like a lion every spring. Our Craig's List kitty is missed. 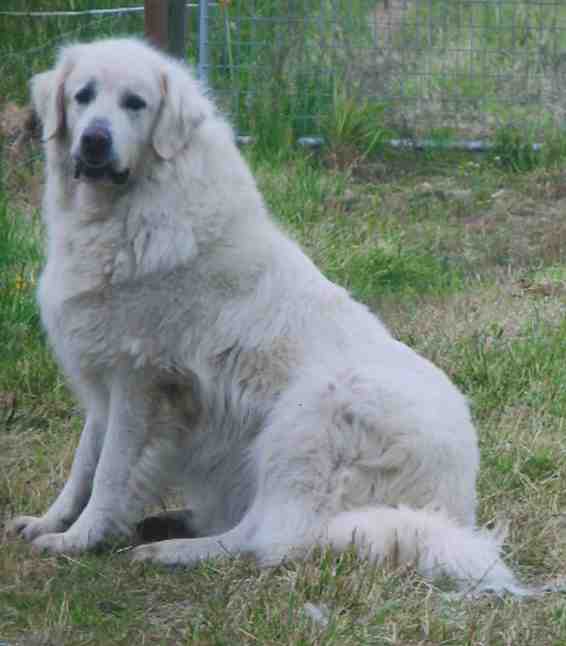 Aslan was a purebred Anatolian Shepherd who had extensive guarding experience which he shared with our other guardian dog Cher. He came from Mike and Pam Hruby of Arizona. While they had him, he killed a bobcat and a coyote. Aslan weighed in at 165lbs and was all business when it came to guarding. Most of the time you thought Aslan was asleep, but he came quickly to life when needed. We lost Aslan to Bone Cancer, which we have since heard is very common in the Anatolian breed. He is greatly missed around the farm. With the increased space at the new farm, it quickly became apparant that a cat would be a must for rodent control. Lucy was our second feedstore cat. She had one litter of kittens before we got her, she is now spayed. She had proven herself to be a valuable addition to the family. She had been hunting more and more in the woods around our farm and we fear a coyote got her. *Espera was a 1993 import who came in the Vicker's importation. She was purchased by Kay Sharpnack and produced for her for 13 years prior to her arrival here. Several of her offspring had done well showing and the most famous being El Fuente (*El Fuerte x *Espera). El Fuente resided at Hinterland and was an ALSA Halter ROM and Champion recipient. His full brother Escondido (owned by Carlos Mendoza) was part of the ALSA Get of Sire group for *El Fuerte that helped him win his title. *Espera was a kind and quiet female that was a pleasure to own! We had hoped to cross her with our male "Eagle" but she died from colic before we could make that dream happen. Our very first cat we had ever owned in our lives. Maui was a special girl who could be counted on to never miss a meal or chance to remind you she was hungry. Even non-cat people loved Maui, she was unique and a character. We really miss her a lot!